Easy Southern Fresh Peach Salsa is quite possibly the most delicious and versatile recipe I have ever made. And, since I have been cooking most of my life and have over 300 recipes on my blog, that is saying something! First of all, I am obsessed with peaches right now. They are just starting to show up at the farmers’ markets, and there is something really special about the first early peaches of the season. One bite of these scrumptious and fragrant peaches is a happy reminder of the simple pleasures of our warm, blissful summer days. 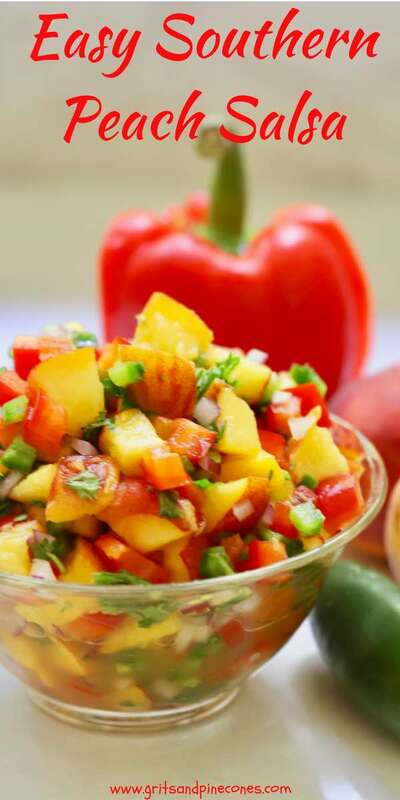 All it will take is one taste of this sweet and savory Peach Salsa and you will be enamored too! 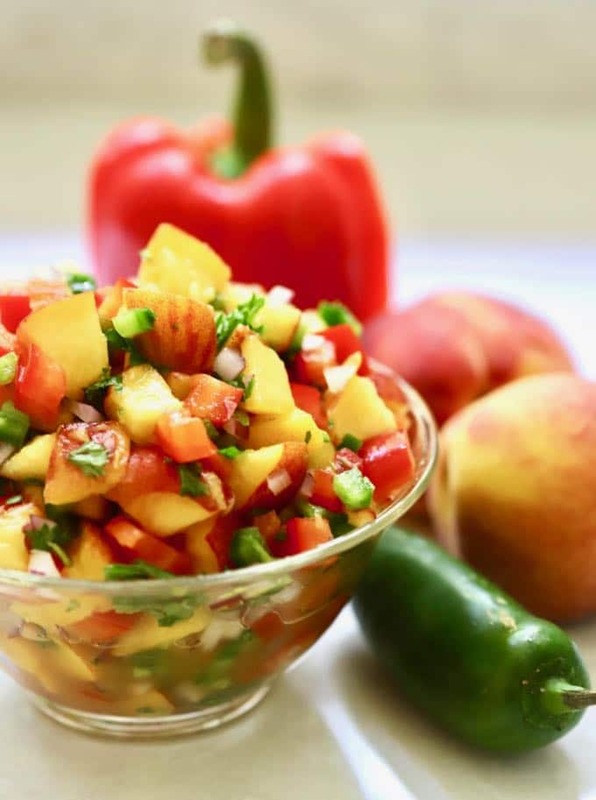 This quick and easy, healthy peach salsa recipe calls for fresh, luscious sweet peaches and crisp and zesty jalapeños, along with some fresh red bell pepper, a little onion, fresh tangy lime juice, and cilantro. My husband and I like this peach salsa so much that in the last week, I have made two big batches and we have enjoyed it as a salad, on quesadillas, and the icing on the cake, as a topping for a pork tenderloin that he grilled. Take my word for it, this quick and easy salsa is life changing, and if you have five minutes and just a few simple ingredients you can see for yourself! Now I know there are some of you that don’t especially like spicy food, and you might have said: “no way” when you saw that one of the ingredients was jalapeños. As with most recipes, you can adjust the ingredients to suit your taste by either leaving the jalapeño out altogether or just reducing the amount you add. You also might be surprised to learn that once you remove the seeds and membrane, which are what contain capsaicin from the jalapeños, they really are on the mild side and don’t pack as much heat as you might think. If you are like me and love peaches too, I think you might also like these popular recipes on my blog: Homemade Fresh Peach Ice Cream, Grilled Chicken with Peach Glaze, Easy Southern Fresh Peach Bread, Homemade Peach and Blackberry Crumble, and Southern Peaches and Cream Pie. 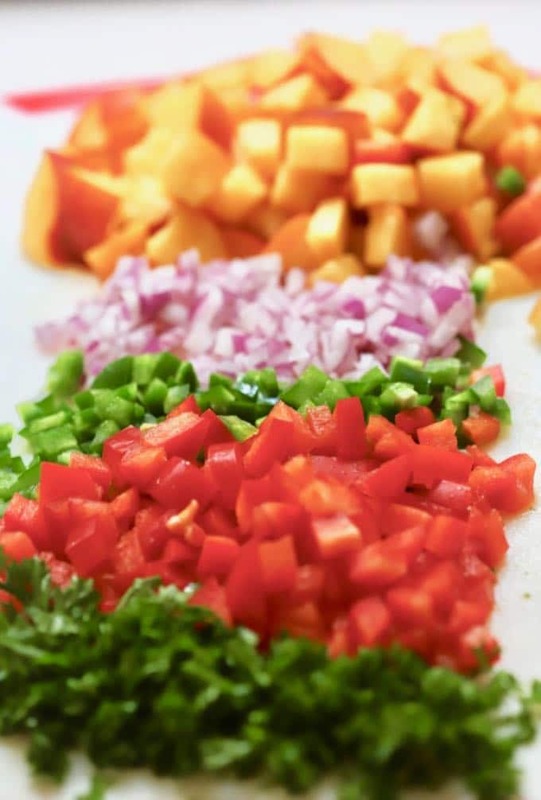 Place the peaches, onion, bell pepper, cilantro, jalapeños, salt, and pepper in a large bowl and mix well. Squeeze the lime juice over the salsa and mix to combine. 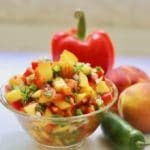 Easy Southern Peach Salsa can be served as a salad, as a dip with chips, or as a delicious topping for pork, chicken, or fish. To seed a jalapeño, slice it lengthwise. Use a small spoon to scrape out the seeds and any membrane (a grapefruit spoon works great for this). After you chop up the jalapeños, be sure to wash your hands thoroughly and do not touch your eyes because the juice can burn them. All it takes is one taste of this sweet and savory Easy Southern Fresh Peach Salsa and you will be enamored! 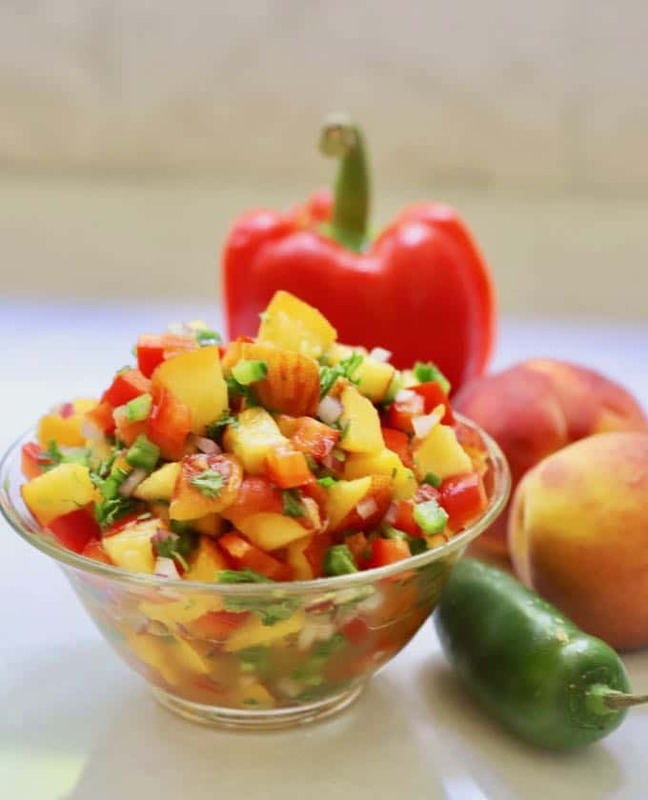 This quick and easy, healthy recipe calls for fresh, luscious sweet peaches and crisp and zesty jalapeños, along with some fresh red bell pepper, a little onion, fresh tangy lime juice, and cilantro. Place the peaches, onion, bell pepper, cilantro, lime juice, jalapeños, salt, and pepper in a large bowl and mix well. To seed a jalapeño, slice it lengthwise. Use a small spoon to scrape out the seeds and any membrane (a grapefruit spoon works great for this). 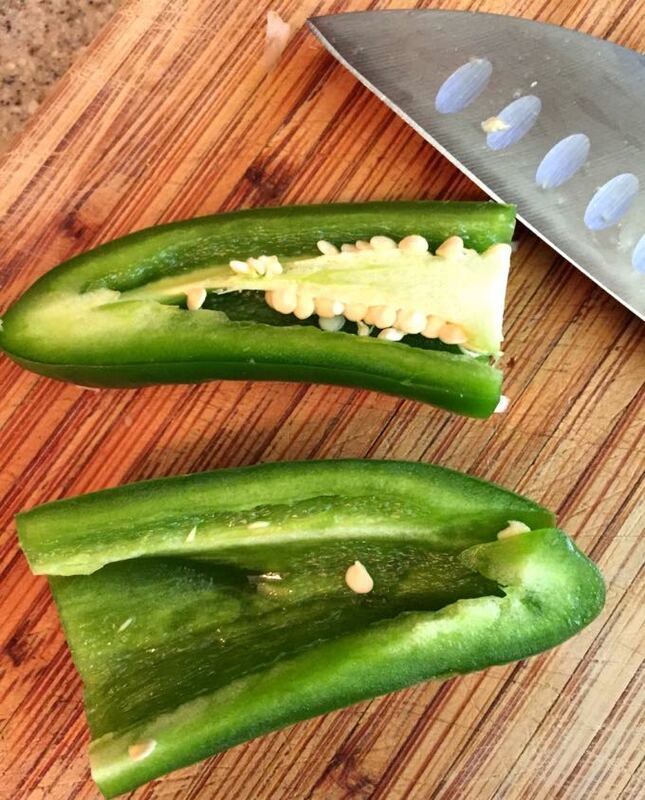 After you chop up the jalapeños, be sure to wash your hands thoroughly and do not touch your eyes because the juice will burn. This recipe works well with Mangos too! You are so right! 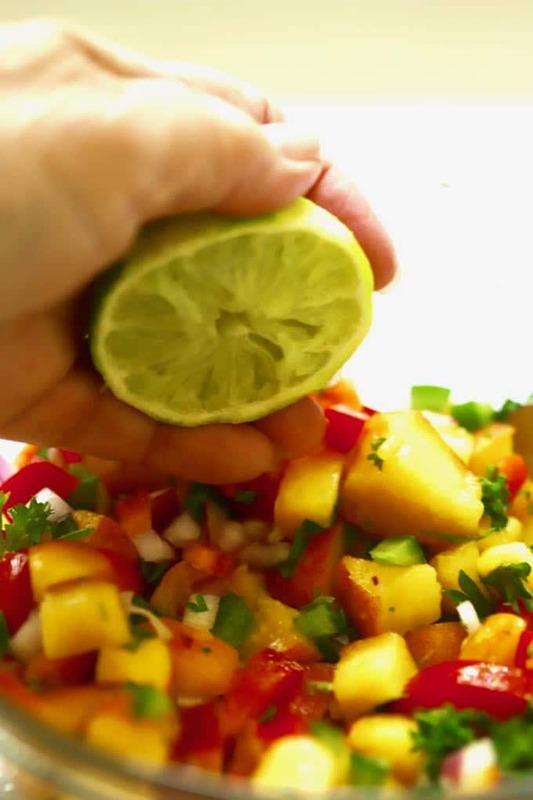 I love mango salsa too and make and serve it often! This Salsa recipe sounds so fresh and delightful. Will be making this soon. I am planning to add mango too, along with the peaches. Hi Bev, peach, and mango together sounds delicious as do just peaches or just mango. No matter how you put it together or which fruit you choose, I don’t think you can go wrong with this recipe. I am so excited about this recipe. Peaches are a family favorite and a seasonal delight!